We serve the Tampa, FL area and can take care of all of your commercial electrical repair needs in an efficient, professional manner. When your business runs into an electrical problem, your employees’ safety is put at risk and your operations may cease to function as smoothly as they should. For these reasons, it’s essential that you have a trusted electrician on your side who can repair your electrical system and restore safety to your premises. This is where our team at 5 Star Electrical LLC comes in. We serve the Tampa, Florida area and can take care of all of your commercial electrical repair needs in an efficient, professional manner. Reliability—When there’s an electrical problem on your property, it needs to be resolved right away. You can rest assured that after a repair job presents itself, we will be there to take care of it as soon as possible. Knowledge of electrical safety—All of the electrical work that we do meets our extremely high standards for quality workmanship. Additionally, we abide by local codes and regulations. Commitment to your business—We value your willingness to work with us and will only do what is best for your business. Remember, once an electrical problem develops at your location, it won’t go away on its own. 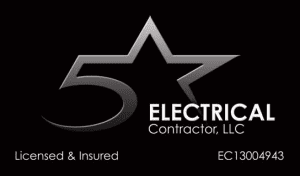 If you ever need commercial electrical repair services, make sure you contact us at 5 Star Electrical LLC right away. We look forward to serving the electrical needs of your business.